Shows why it could be a bad idea to remove the 49G's screen cover. Triangle solver for both the G and S series written 100% in System RPL. When given three measurements of a triangle (sides or angles) it automatically solves it, giving the three sides, three angles, three heights, and the area. An Emu48 skin (KML and bitmap) for the 50g, designed to run on small portable computers with a 480-line screen. While it is intended for use with Emu48 on a computer like the small Asus Eee PC with an 800x480 display, it could also be used on advanced mobile phones with 320x480 displays if a 50g emulator were written for them. Explains how to use the CRLIB library creator included with the 49G. 20 icons of the HP 48 and other HP calculators for Windows. The HP 49 usually comes in a box (easier to open) in Europe and a plastic blister pack (harder to steal) in North America. This photo shows the two packaging methods side-by-side. 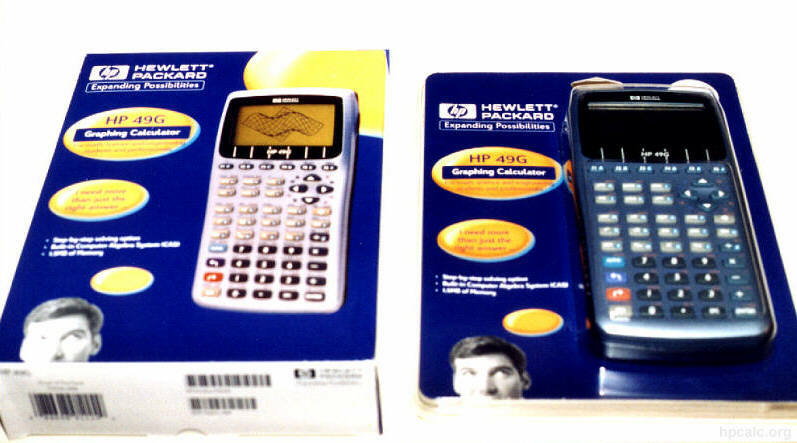 Three photos of HP 49 prototypes demonstrated at the 1999 HP Handheld conference in Vancouver. Listing of many of the most important mistakes in the HP 49G Pocket Guide. Includes unformatted text and formatted Word 97 and PDF versions. Language files for HPUserEdit 4.0, translated into English. Simply extract to your HPUserEdit installation directory. Comprehensive introduction to Saturn assembly language. This isn't complete yet, so some sections are missing, but it is already 141 pages long. In HTML format; not recommended because of its size. Comprehensive 189-page introduction to Saturn assembly language. In Adobe Acrobat PDF format; this is the recommended format. Comprehensive 189-page introduction to Saturn assembly language. In Microsoft Word 2000 format. The best table of values command, extracted from MathTools 7.0. A comprehensive review of the Meta Kernel ROM card. List of all the new Saturn+ instructions added to the Saturn emulator in the Apple-platform calculators, such as the 49g+ and 48gII, listing both the mnemonics and the opcodes for each instruction. Front-end for TED, with menus for viewing, deleting, renaming, and creating files, plus I/O functionality. User defined language file and autocompletion (API) file for Notepad++ for the HP Prime Programming Language (HP PPL). The Connectivity Kit is sometimes awkward and not very user friendly (with no support for find/replace), making Notepad++ a much more friendly choice. These files not only add syntax highlighting but also documentation for nearly 600 functions, showing the parameter syntax and detailed descriptions as the code is typed. Classic 5 in-a-row game written 100% in System RPL for two players only. Includes version 2.0 for the 80-line screens and version 1.2 for the 64-line screens. Scan of the inside of the bottom half of an opened HP 49G. Scan of the inside of the top half of an opened HP 49G. Extremely high resolution skin (bitmap and associated KML script) for Emu48+ 1.59 or higher (or Emu48 for Android 1.3 or higher) for emulating the 50g in the highest possible resolution, with 2880 by 1440 resolution. Designed to look as real as possible. Optimized for use on Android. A skin (bitmap and associated KML script) for Emu28 1.31 or higher for emulating the 28C. Includes a custom icon, is intended for 1024x768 resolution or higher, and was designed to look as real as possible, including support for a borderless window for a virtual floating calculator. Collection of skins (bitmaps and associated KML scripts) for Emu42 1.21 or higher for emulating the 14B, 17B, 17BII, 19BII, 27S, 28S, 32SII, and 42S. All versions include custom icons, are intended for 1024x768 resolution or higher, and were designed to look as real as possible, including support for a borderless window for a virtual floating calculator. Collection of skins (bitmaps and associated KML scripts) for Emu48 1.61 (or Emu48+ 1.59) or higher for emulating the 38G, 39G, 40G, 48SX, 48GX, or 49G. Includes medium (2X) and large (3X) versions, in both full-bezel and cropped versions, for all calculators, as well as custom icons. All were designed to look as real as possible, including support for a borderless window for a virtual floating calculator. Collection of skins (bitmaps and associated KML scripts) for Emu48+ 1.57 or higher for emulating the 39g+, 39gs, 40gs, 48gII, 49g+, and 50g. Includes medium (2X) and large (3X) versions, in both full-bezel and cropped versions, for all calculators, as well as custom icons. All were designed to look as real as possible, including support for a borderless window for a virtual floating calculator. Falling snow animation. If you live where I do (North Dakota, USA), you'll see a lot of this! Includes versions for both 64-line screens (49G/48gII) and 80-line screens (49g+/50g). Full (registered) version of StatsPack, cracked and ported to the 49/50 by me and included with the permission of the author. Evaluates probabilities for any random variable X which follows a binomial model, a Poisson model, or a normal (Gaussian) distribution, or evaluates the percentage points for a standardized Normal distribution. Review on James Donnelly's "The HP 48 Handbook." Takes an integer and inserts thousand separators to make it easier to read. Replacement United States keyboard layout for Windows, adding the ability to easily type special characters specifically for the HP Prime using the AltGr (right Alt) key. For example, characters such as Σ, ∞, ∫, ∂, →, √, ▶, and others may be easily typed when this is enabled. Also, dead keys are added to the AltGr plane for typing characters with diacritical marks, such as Ł and é. Tested with Windows 7 and Windows 10. Machine language demo with animated worms. Includes a version for the 49g+/50g that uses the full screen.